In today’s busy world, the importance of having enough sleep has been slightly forgotten. Most of the time, we are too indulged in the things that we need to accomplish to the point that we sacrifice the time that we have to get out well-deserved rest. You see, sleep is an important factor that significantly influences your general well-being. In addition, it was found that time spent in sleeping is not the only thing that should be considered. Your preferred sleeping positions also have implications on your health. Different sleeping positions have their own pros and cons. 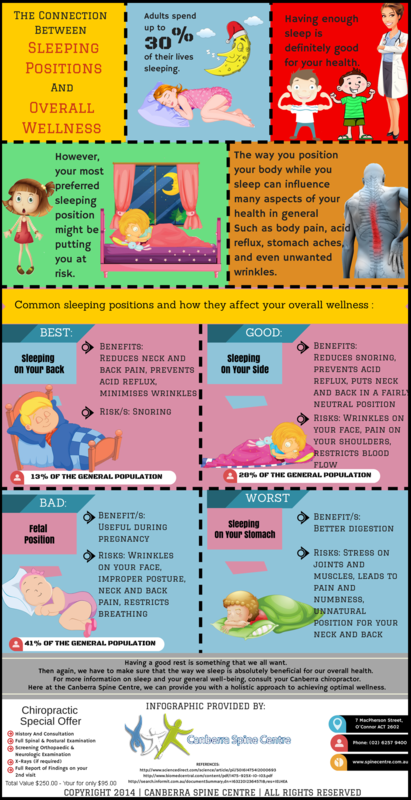 By exploring the risks and benefits of these positions, you can make better decisions on how you should sleep so as to uphold your utmost health. Also, you can consult your trusted chiropractor here at the Canberra Spine Centre for expert advice on how you can maintain your mind and body in perfect condition naturally and effectively. Your gentle Canberra chiropractor is committed to helping you achieve and maintain better health so that you can experience a better quality of life. Here at the Canberra Spine Centre, we can provide you with chiropractic care and other complementary health services that contribute to our holistic approach towards optimal wellness. Call us today on (02) 6257 9400 or simply book an appointment online.